Business creates goods or services and delivers them to a market that buys or uses them for a fee. Everyone’s happy! That’s the way it’s supposed to work, but anyone who has tried to make a living in the real world have experienced the complexities inherent in such a simple formula. There are many variables that can impact the outcome, but let’s just focus on the marketplace and the research required to understand it. The market can be a small or vastly large group of people who need goods and services. They’ve got money in their pockets and businesses are looking to have them use it to purchase their product or service. But that’s a very general sketch of a process that requires a lot more specifics. How does a business gather the data they need to understand the needs and wants of the market, and who they should be targeting when developing ideas, advertising and marketing projects? That’s not so easy—especially from the perspective of a cubicle. There’s a world outside the office and businesses need to know it intimately if they’re to offer something that the world wants. Whether it’s a delicious meal or a product people don’t even know that they want yet, this process starts with market research. Market research is shorthand for talking about an organized effort to gather information about customers. It’s a way to profile and target people to know what they desire or what they need, so businesses can exploit that and produce it to their satisfaction. Market research is a relatively young discipline. It began to be conceptualized and practiced in the 1930s, and it grew out of the boom in radio in the United States at that time. Advertisers learned that listener demographics were crucial to companies who sponsored different programs. Market research is a cornerstone on which a business strategy is built, market research being about specific markets while the larger business strategy is about the process of marketing. Market research is fundamental to keeping businesses competitive as it analyzes the needs, size and competitors in the marketplace, so companies can make strategic decisions. There are various techniques to market research. Some are qualitative and use focus groups, in-depth interviews and ethnography, while others are quantitative, which involve customer surveys and analysis of secondary data. Primary research is when the effectiveness of sales, existing business practices, quality of service and communications are monitored and reported on. This helps the business understand the competition and evaluate a strategic business plan to take advantage of the market. Secondary research uses data that has already been published and is collected in a new database to help with situation analysis. From this, businesses can develop strategies for benchmarking and targeting specific market segments. Market research is important for the obvious reason that without it, a company is firing blindly into the void. You can create a great product or service, but without knowing who to sell it to it will whither on the vine and die. There might have been a time when market research wasn’t as necessary, when there was less competition and so customers could find your product or service. But that time has long since passed. The more knowledge a company has about the market and the customers needs within that market, the more likely they’ll have success. There are many reasons why businesses should conduct market research. It helps to identify problem areas in your business. You can’t resolve a problem until you first know what it is. It’s not just about selling products and services. Market research is also important in that it helps increase customer satisfaction. That means businesses retain more customers and their brand is less likely to be tarnished by false steps and miscalculations. By using tools like surveys for customer feedback, you’re also going to understand the needs of your existing customer base. It’ll help you to know why they’ve chosen your company over your competitors, which will allow you to better serve them. Using market research is one way to help marketing campaigns be more effective. It identities new business opportunities and then designs the best marketing push to capture the target audience. This is a sure-fire method of increasing sales, which is the backbone of business success. There’s also the benefit of having a bead on what your competitors are up to in the marketplace. It can be used to evaluate your progress but also what your competitors are up to and how they are expanding or not in the market. Knowing what your competitors are up to will offer insight in how you want to strategically place yourself in the market to stay ahead of them. Market research is also a way to reduce and often avoid loss. If you know the landscape well before you launch a product or service, you will be aware of hurdles to clear and problems to avoid. You’ll also have a better idea of the risks involved in bringing something to market and therefore be able to work on solutions for those risks if they in fact arise. Then there are the business opportunities that arise from market research. These are new areas that a business might have been ignorant of before and now can exploit for greater market penetration and profits. It will also highlight areas where the business can expand and increase its customer base. New customers can also be discovered through market research, further expanding the company’s reach. Gap analysis is one method that can be used to evaluate how well a service is performing versus its potential. Another reason for businesses to conduct market research is that it allows them to set achievable targets for growth, sales and product development. It provides businesses with information that helps with the decision-making process about services and effective product development strategies. There are many ways to get the data you need for market research. Some of them include starting with a business’ own employees. They’re on the frontlines with customers and can offer valuable insight. Customers can be tapped with comment cards that ask basic questions. Talking to your existing customer base through the web, email, snail mail, telephone surveys or in person with focus groups is one of the best ways to know what they want and need. You can also track what customers are buying and not buying from you through documentation and records. In terms of secondary sources, there are resources such as the census bureau, the local chamber of commerce, the department of commerce, libraries, trade and professional organizations and publications. The process of conducting market research follows these six steps. Before you can sell something, you must know who you’re selling to. What’s their age, gender, location, what do they do for a living, how big is their family, what’s their income, etc? The more data you can get, the better targeted your marketing campaign will be. Now that you have a profile, you want to find a representative sample of those targeted customers to understand their characteristics, challenges and buying habits through focus groups, surveys, phone interviews, etc. When gathering customers for your surveys, you’ll want to get a group that represents each buyer persona you have come up with. It’s good to have a mix of people but you can choose one person, if you think that’s best. Make sure whoever you choose is someone who has recently interacted with you and your competitor and even those who are not interested in purchasing from either. This widens the lens and gives you more accurate view of the marketplace. For the data collected to be accurate and usable, you must engage the participants, whether they’re the ideal panel or not. Try to get a list of customers who made recent purchases. There are also those customers who purchased from competitors or were close to choosing your product or service but didn’t. You can reach out for participants on social media, leverage your existing network or create an incentive to participate. Once you have a group, you must do your due diligence and have targeted questions that have been worked on to get the most out of the audience and help you with the problem at hand, otherwise you’re wasting everyone’s time. You want the discussion to be natural and conversational, not scripted. However, it should include a short backgrounder, followed by a short response from the audience on their opinion or problems with the product or service. Then, take a deep dive into buyer researched potential solutions (make this interactive, following up and interjecting more specific queries). Wind down with decisions from the group, and close by opening up for questions and thanking the people there. They’re doing the same thing as you, so the more you understand them and how they act, the better you can respond and exploit areas that they’re not exploring. Also, competition is complicated. It can be a whole company or a division within that you’re competing with. But you must list the competitors and always be aware of them. Now comes the time to crunch the numbers and look for common threads that runs through the data you collected. It can be overwhelming at first, all that information, which is why it’s wise to boil the work down to the essential findings. These make actionable points. Break your final report into sections: background, participants, executive summary for the main points, awareness for the common questions, consideration for the themes you uncovered, how the group came to decide, and finally an action plan on how to move forward with the information you gathered. 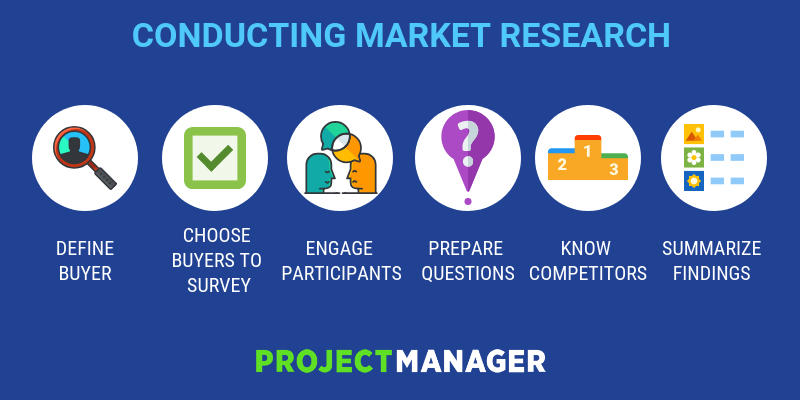 Market research is a project, and projects need tools to manage them. ProjectManager.com is a cloud-based project management software that has a robust dashboard that can collect, crunch and deliver the market research you gather in easy-to-read and share charts and graphs. Plus it features task management tools like Kanban boards and task lists to keep the project moving forward. See how it can help you make sense of your market research today by taking this free 30-day trial.